6.79 points at 14 votes (rank 414). 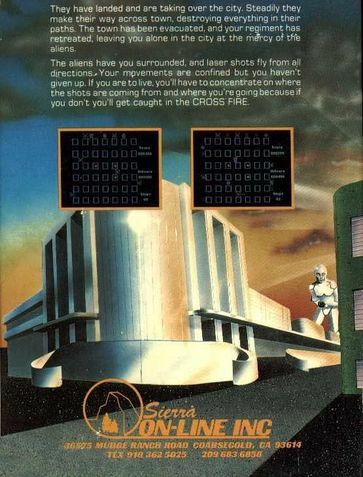 Crossfire is a shooter by Sierra Online, Inc., which was released at first for the VIC-20 and the Atari 8bit computers in 1981 and ported to the C64 in 1983. 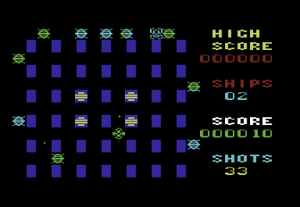 The player steers a spaceship over a game area that is parted into seven rows and six columns by 42 blocks. At the border of the game area alien attackers are posted. 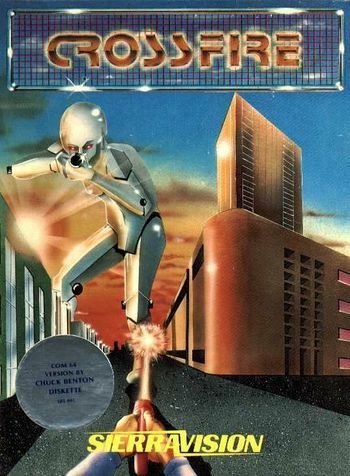 They are shooting and after some time they leave their secure position to go on a chase for the player. A level is done when the player succeeds in shooting all attackers. 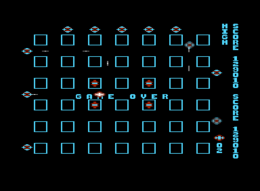 However, the player's spaceship has only limited ammunition, so that more supply has to be collected from time to time. You can gain extra points by collecting up to four bonus items per level. 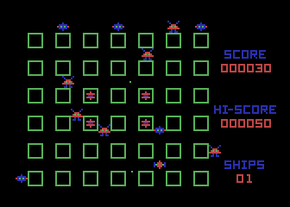 The graphics are even for a game from 1983 rather bulky and simple. As a background sound there is a saucy electropop version of the title tune from "Peter Gunn". At the right border of the screen you can see the current highscore and score, but there is no highscore list. 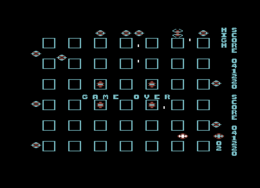 The level buildup is not changed in the further course of the game. After the start of the programme there is a short demonstration of the game when waiting for a while. You start with three spaceships and get a bonus ship every 5.000 points. The spaceship can only stop at crossroads but turn around the flying direction at any time. 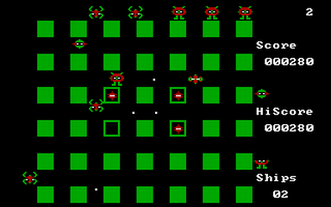 Around the game area 11 enemies are posted, which shoot at the player and after some time start to chase him actively. When an enemy is shot, it turns into the next type and returns to its original position. Only after the fourth transformation is the enemy completely eliminated. For one hit you get 10 points for the first type, 20 for the second type, 40 for the third and 80 for the fourth. As soon as only five attackers remain, they all leave their starting position at the same time and heckle the player together. Enemies of the same type can accidentally shot each other. After each twelfth shot that a player fires, one of the four bonus items appears. It can be collected to get extra points. After the appearance of the bonus item the player is only allowed to released a maximum of six shots or else the bonus item will disappear again and no further items will appear in the current level. Collecting the bonus gets you 100 points for the first one, 200 for the second, 400 for the third and 800 for the last bonus item. At the start of the game the player has 35 shots. When the ammunition supply is under 10 shots, the additonal ammunition symbol appears which should be collected before the ammunition is completely used up. At the start of each following level the maximum ammunition supply is lowered by five shots until it has reached the minimum of only 15 shots. When playing with the keyboard - in contrast to playing with the joystick - it is possible to carry out the movement and the shooting independently (e.g. you can fly to the right but shoot to the left at the same time). Economize with the ammunition as it is limited. At the border of the game area you have fewer directions from which you can get attacked but also fewer possibilities to avoid the shots. When a bonus item appears, you should do everything to reach it as fast as possible and during this shoot as little as possible, because after the sixth shot it will disappear again and all other items expire for this level. As the last item is worth 800 points, you risk a high loss of points when shooting around thoughtlessly. The ammunition should be restocked before all five remaining enemies at the end of the level start an attack simultaneously. After the last enemy is shot, you have a few seconds to collect the maybe still remaining bonus item. The maximal score per level is 3.150 points. The Commodore 64 version by Bod/Talent has trainer options. 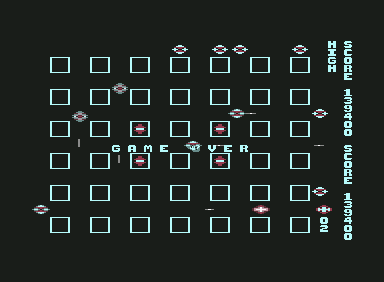 The Commodore 64 version is also bugged. Once reaching 10, the score displays garbage chars instead of the correct amount of lives. 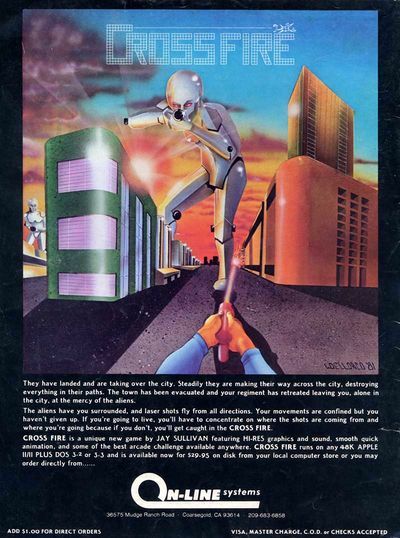 Robotron2084: "A sweaty reaction test without frills from the C64 stone age with groovy music and sometimes hair-raisingly close situations in which you only escape - or do not escape - by luck rather than judgement from the hostile crossfire. Carelessness and wild shooting around is redeemed very quickly with a Game Over. 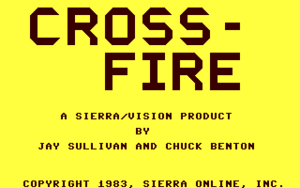 Crossfire is so ingeniously simple, that you can play it again and again, although in the long run the diversification is missing. 6 out of 10 points." TheRyk: "I absolutely agree! Nitpickers might complain about the lack of further levels. But it is a game from 1983 which is difficult enough in the first place and the increasing need to recharge also increases difficulty, because that is dangerous enough. You need some practice until you experience some kind of flow feeling and can play rather often before it gets boring. 7 points for this easy, challenging and fast shooter oldtimer." This page was last modified on 3 March 2017, at 17:29.